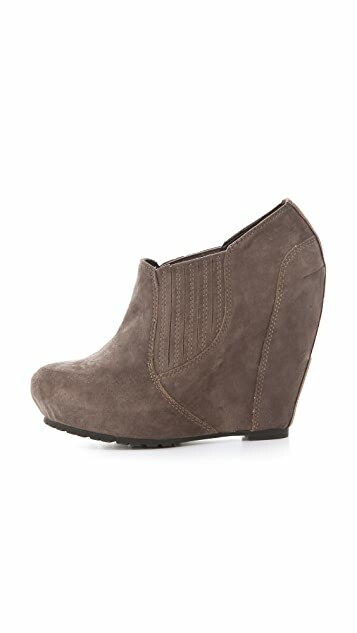 This chic pair of wedge booties is cut from soft suede. 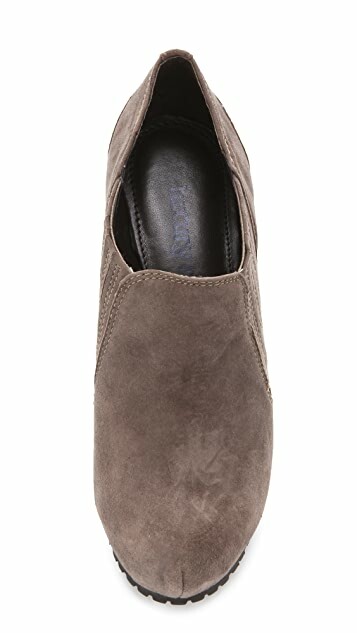 Hidden elastic at the instep allows for an easy slip-on fit, and seaming contours the silhouette. Hidden platform and wedge heel. Lug sole. Avant-garde, affordable, everyday wearable: Luxury Rebel shoes may just be the holy grail of footwear for fashion forwards. A new line from French shoe designer Jean-Michel Cazabat, Luxury Rebel utilizes the finest luxury materials, and then animates them with the free-spirited, glam-rock decadence of the 1970s. Expect booties, sandals, and pumps with Cazabat's signature whimsical prints, artful silhouettes, and ultra-femme details. Buy a size bigger, got the last pair 39.5 size, was supposed to be 38 for me usually. Perfect fit for me! Color is actually darker, so that's great as well! Nice fit, and comfy! I think that some places list European shoe sizes as 36:6, 37:7, 38:8... but when I lived abroad in the UK, most shop attendants told me that it's actually 37:6, 38:7, 39:8.... so that's generally the sizing I go by when I buy European sized-shoes. So with that in mind, these shoes fit really well for me. I really like that there's treading on the bottom, since they are a bit rectangular, it gives more stability when you walk. I personally love the look they give. 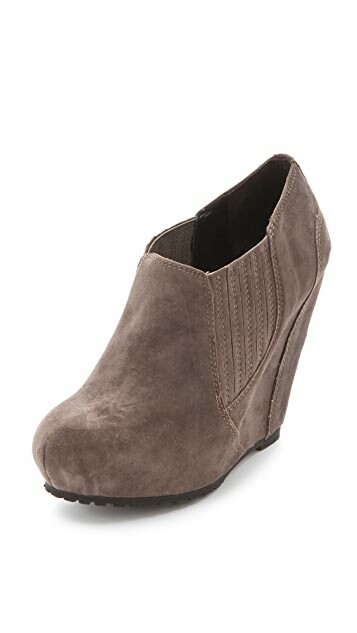 I was looking for a pair of booties that would be comfortable but still have some height and I thought these wedge booties would be perfect. I'm usually a 7-7 1/2 in shoes so ordered the 7 1/2 so I could wear these with socks. When they arrived they were way too small and the shape didn't look right. The wedge was much smaller than I expected and the heel just made the booties look like little rectangles on my feet. Was not impressed at all. Also the opening at the ankle was very large and even though the shoe was too small it still felt like my feet were slipping in and out of the shoe. Because of that I didn't bother reordering a bigger size. I did end up ordering the luxury rebel wedge boot and that one was true to size and a better shape. Still looking for a good bootie tho!! Like other reviewers said, they do run small to size. I normally wear 36.5; ordered these in size 37 and they are perfect. Actually, 37.5 might even fit better but I instantly loved the boots too much to return and re-order in a different size. 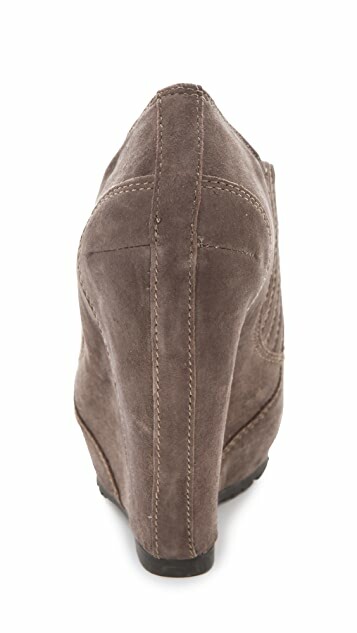 I have these in Taupe, it's the kind of darkish taupe that leans more towards brown than gray. A very pretty colour, and the shoes are comfier than I expected. I can wear them all day without killing my feet. Overall very happy with the purchase. Too small. I usually wear a 7-7.5 US, and got these in 37.5. Maybe I'll try the 38. I bought theses a half size bigger than my normal size, and they fit perfectly! Super cute and pretty comfortable for this sort of shoe, an overall great buy! I bought these and the very same day I received them I shipped them right back. These shoes ran too small and the color is much darker then I expected. I am sad because they are cute but the size and color killed these shoes for me.